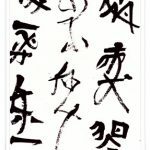 Asian Calligraphy - is it written or drawn? Chinese and Japanese calligraphy is created with a brush, on a white sheet of paper that could be seen as a canvas. In opposition to the Western calligraphy, Far Eastern calligraphy is not a craft, but an art. In fact, it is often referred to as art within art, as it utilises both visual and linguistic media to move the viewer emotionally (poetry of the words combined with the imagery of the lines, beauty of the composition, its energy, and sensible passion of the artist). Calligraphy is also called the “heart imagery” or the “soul painting”. 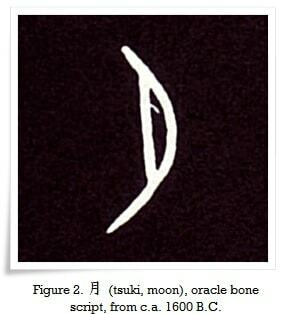 Further, there are six groups of Chinese characters depending on their different etymology. One of them is called 象形文字 (しょうけいもじ, shōkeimoji, pictographic characters). 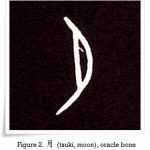 The fact that some characters’ shape is based on real life objects (such as 日 (Figure1) is a pictograph of the Sun, or 月 (Figure 2) is a pictograph of the Moon, etc.) could further mislead us into a conclusion, that they were originally drawings. All those factors would suggest that Chinese and Japanese calligraphy is drawn. It is, however, not so. First, let us look at the fact that calligraphy is based on Chinese characters, and how it affects its definition. It is not possible to create a calligraphy work, in the Far Eastern sense of the word, by means of the Roman alphabet letters. I will use a simple example to explain this. In the English word “road” you will sense no feelings, as there is no imagery hidden in the lines of the passionless letters, just by looking at it. At best, all you will be able to imagine is a piece of asphalt, and a ray of sun bouncing off of it, if you are lucky. Trying to “paint” with Roman alphabet is a bit like writing a poem about love in a binary code. 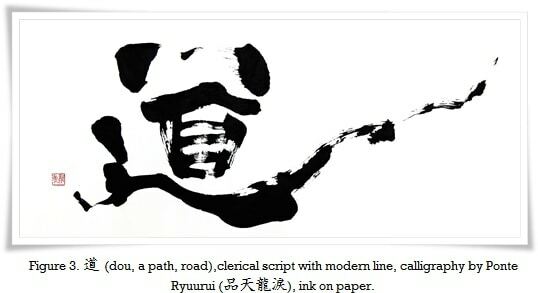 Chinese or Japanese calligraphy of the character road can tell us a whole story of the path of life, full on colourful events that, depicting the joy and hardship of a hermit or an adventurer walking it (Figure 3). Nonetheless, despite all that imagery, kanji for “road” is still a word, a character that is written down, and not drawn. It is just artistically and visually richer, and far more abstract, than Roman alphabet letters. Going back to the pictographic characters mentioned above, they were not drawn either. 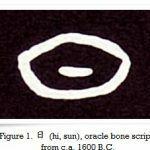 Oracle bone script (甲骨文, こうこつぶん, kōkotsubun), which is a script abundant in shoukei moji, was written on the animal bones and tortoise shells with a brush and then carved afterwards, or directly carved on their surface, and then rubbed with cinnabar. These, however, were not drawings but a written legible text, usually conveying a divinatory message, or recording important state events. This again points at the fact that Chinese characters are written not drawn. 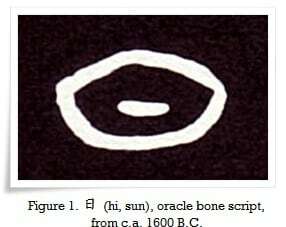 What is more, archaeological findings of bones covered in well executed Oracle bone script characters, obviously created by a master or a teacher for students to follow (they were called Zhen Ren), with a rather wobbly and uneven characters beside it, would suggest that first calligraphy “schools” existed already during the Shang dynasty period, where proper techniques of writing (practiced all over by the students) were thought. Chinese believe that calligraphy and ink painting are sister arts. They are very closely related, yet different. They use the same tools: The Four Treasures of the Study (brush, inkstone, ink and paper). They share the same principal of being abstract forms of art. However, there are important facts that distinguish them. First one is that painting cannot be read as a text. In this capacity, some Chinese calligraphy experts feel that abstract calligraphy works (especially Japanese avant-garde calligraphy, 前衛書道,ぜんえいしょどう, zenei shodō) lose its touch with the world of 書 (しょ, sho, calligraphy), especially when the written characters become impossible to read. This could mean that such calligraphy is more of a painting than calligraphy. 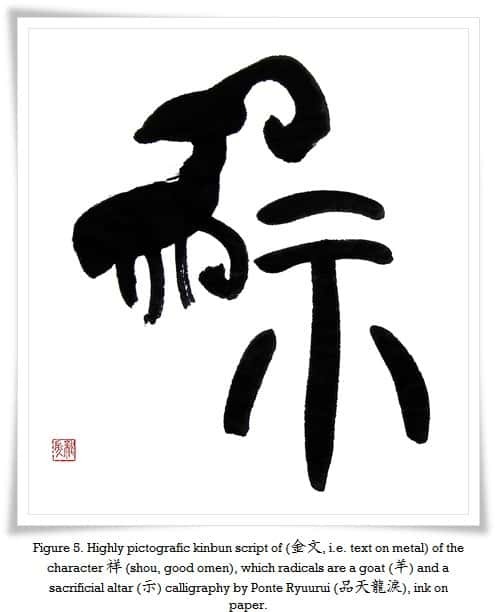 Others argue this theory, and say, that the calligraphy (modern Chinese calligraphy) which uses a calligraphy line for writing a non-character calligraphy (Figure 4), or, the one that uses the ink painting line for writing Chinese characters, is still a calligraphy art, and not painting. Based on this controversial subject of modern calligraphy, it is undisputable that traditional Chinese and Japanese calligraphy are definitely written, and not drawn. All that the phrases “heart imagery” and “soul painting” is trying to tell us, is that a calligraphy work can be read as a text, felt as poetry verse, and admired as a “painting” at the same time. This is why we refer to it as art within art. Now, let us look at the kanji used for the phrases “calligraphy” and “ink painting”. Calligraphy in Japanese is written as 書道 (which means “a way of writing”, or to be more philosophical, “a path to finding truth about self through writing”). In Chinese, it is 書法 (shū fǎ, i.e. the laws of writing). As you can see, both words have the kanji 書 in them, which means “to write”, and not “to draw”. On the other hand, the ink painting is known as 水墨画 (すいぼくが, suibokuga, i.e. water ink painting) or 墨絵 (すみえ, sumi-e, i.e. ink picture/painting). The kanji 画 and 絵 mean “a picture”, “a drawing”, “a painting”, etc. What can be confusing is that kanji 画 also means “a stroke” (a line that kanji are constructed of), in Japanese. In Chinese it still mean “a painting”, or “a drawing”. Please remember that ink painting also uses brush strokes, hence it is easy to be misled. I believe that the issue that causes mistaking calligraphy for a drawing lays in its abstract nature. Chinese characters are not directly understandable as Roman letters, and they require artistic effort from the viewer, similarly as it is when one admires a painting. Calligraphy has many layers, just like a sky covered in mysterious clouds. You can read it, but you do not have to. It is enough to look at it to enjoy its unpredictable nature. It is fascinating that it may resemble painting, but in fact it is a written text (Figure 5). Your calligraphy is fantastic, moreover I need some calligraphy work. How can I get some calligraphy work done? Is it very expensive? Many thanks for your kind comment. I am glad you enjoy our site, as well as my humble works. Please feel free to send me an email to [email protected], and explain what is that you are looking for.